Another student has been suspended over Mesquite Independent School District's famously strict dress code. Agnew Middle School officials told seventh-grade Robert Blythe Jr. that his high-top haircut was too long on top. His grandmother, Marie Weatherford, took her 13-year-old grandson to get his hair cut over the weekend, but school administrators said on Monday that his hair was still too high. "They said it was too tall," Weatherford said. "We measured it. It's not even an inch and a half on the tape measure. They wanted him to shave his head, and we shouldn't have to." 13-year-old Robert Blythe was put on in-school suspension because Mesquite ISD administrators say his haircut is too long. 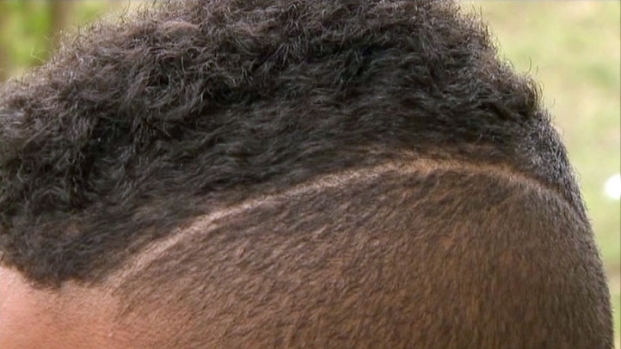 The school district said that what Robert, his grandmother and their hairdresser call a part is a considered a design. "Designs" are not allowed, according to the district's Code of Conduct Handbook. Weatherford offered to color the part in with a marker so her grandson could go to class, but school administrators declined to allow her to do that. The seventh-grader was subsequently placed in in-school suspension. Weatherford said the district is now just splitting hairs. "The guideline book does not state how tall or anything," she said. But it does state that, "Other hairstyles or hair fads may be evaluated on a case-by-case basis and may be determined by school officials to be unacceptable." "These are campus-level decisions that are final," MISD spokeswoman Laura Jobe said. "Our guidelines are clear, as are the discipline procedures." The district said that Robert will remain in in-school suspension until his hair complies with guidelines. "I think it's ridiculous," Weatherford said. "I mean, a kid is there to learn, they're not there to be worried about their hair." MISD is no stranger to hair controversy. The district's dress code has enforced hair length since at the least the 1970s, when it sent home a 10-year-old boy because his hair touched his collar. More recently, a 4-year-old preschooler was placed in in-school suspension in January 2010 because his hair was too long. The district agreed to allow Taylor Pugh into school as long as he wore his hair in "upbraids" off his collar and ears. The fight went all the way to the State Education Commision. Taylor's family is no longer a part of the Mesquite ISD, according to district officials. The district also suspended a middle school student in 2009 for wearing trendy skinny jeans. That boy's parents decided to homeschool him.